Embedded systems and microcontroller programs can be really hard to understand. Here are some techniques that can help. that it is usually very hard to understand what is going on with our program! This problem if hard-to-understand software systems is not at all unique to embedded, it happens frequently also when developing for a PC or mobile device. But several aspects typically make the problem more severe. A friend of mine is building a electronic music instrument, a Hang-like thing with 9 pads. It uses capacitive touch sensors and sends MIDI notes over USB for triggering a sampler or synthesizer to make sound. Core components of system. Capacitive sensor(s) connected to Arduino, sending MIDI messages to computer software over USB. The firmware on the device was an Arduino sketch, using the CapacitiveSensor library to read the capacitance of the pads. Summing up N consecutive samples gives basic filtering, and a note is triggered if the value exceedes a specified threshold TH. The setup worked in principle, and in practice for some ways of hitting the drumpad. But it seemed impossible to find a combination of N and TH where the device would trigger correctly in all cases. If N was too high, then fast taps would be dropped/ignored. If N was low, it caused occational double triggering. If TH was too high, it would not trigger on single finger taps. If TH was too low, it would trigger when a palm was just hovering over the pad. How to make it work reliably? Several hours had been spent tweaking the values, recompiling the sketch, uploading and hitting the pads a bit, listening if it did the right thing. This gave us some rough intuitions about things that worked and not, but generally our understanding of the situation was quite sparse. Which is understandable; there is only so much one can learn from observing a system in real-time from the outside with the naked eye/ear. It seemed that how the pad was hit had an influence. Which is plausible, the surface area might influences how effective the capacitive coupling is. Example poses that should trigger. Hitting with fingertip, finger flat, 3-fingers and side of thumb. Some cases which should *not* trigger. Hand hovering over pad, touching casing with thumb but not the pad. What we needed to understant was: What is the input data in different scenarios? First added logging to the Arduino sketch, sending the time between readings and the current sensor value (for one sensor). The stream showed that with N=70, the reading the sensors took a long time, over 40ms. This is unacceptable for a musical instrument, so it was clear that this value *had* to go down. Any issues caused would have to be fixed in some other way. Then a small Python script to read the serial port, and writing the raw data to a file. This allowed us to record the data from a whole scenario. For instance we recorded things like ‘tapping-3-times-quickly’ or ‘hovering-then-touching’, using the filename as a description for what the scenarios was, and directories to group sets of recordings. Another Python script was then used for analysing the data, parsing the raw values and using matplotlib to plot it out. Now we could finally *see* what was going on, over longer periods of time and compare different scenarios against eachother. This case illustrated the crux of our problem. The red areas indicate where we are hovering *over* the pad with palm, but the sensed capacitance values are higher than when touching with a fingertip. 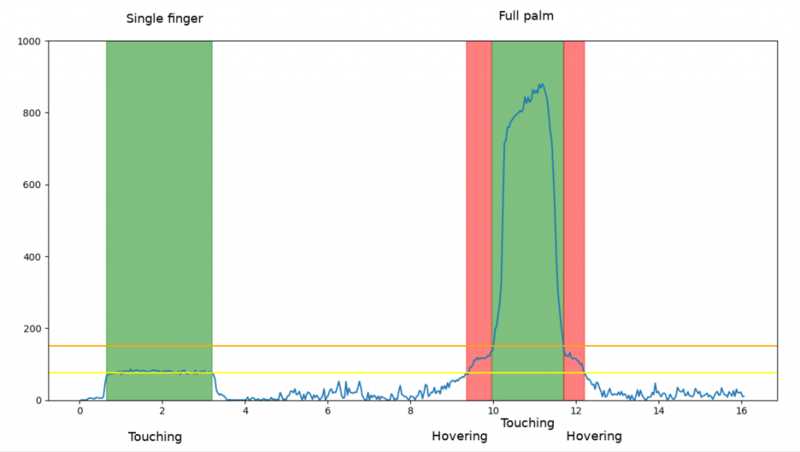 If the threshold is set too high (orange line) we miss the finger tap, and if it is too low *yellow) we will false trigger on a hovering palm. Can we do better with an alternative detection algorithm? Maybe a high-pass filter to detect the changes at the edges, it may be possible be possible to identify both cases. Plugging in a high-pass filter in the Python analysis script and playing with the values seemed to support this. But we cannot run Python for real-time processing. We need to be able to implement the filter in the Arduino firmware. An Exponential Moving Average (EMA or EMWA) was selected as the basis of the filter. It has many desirable properties for use in a latency-sensitive application on a microcontroller: It only requires storing one number, is computationally simple, and is robust against variation in sampling time (jitter). And unlike a FIR filter, it does not introduces latency (apart from the time-constant of the filter itself). 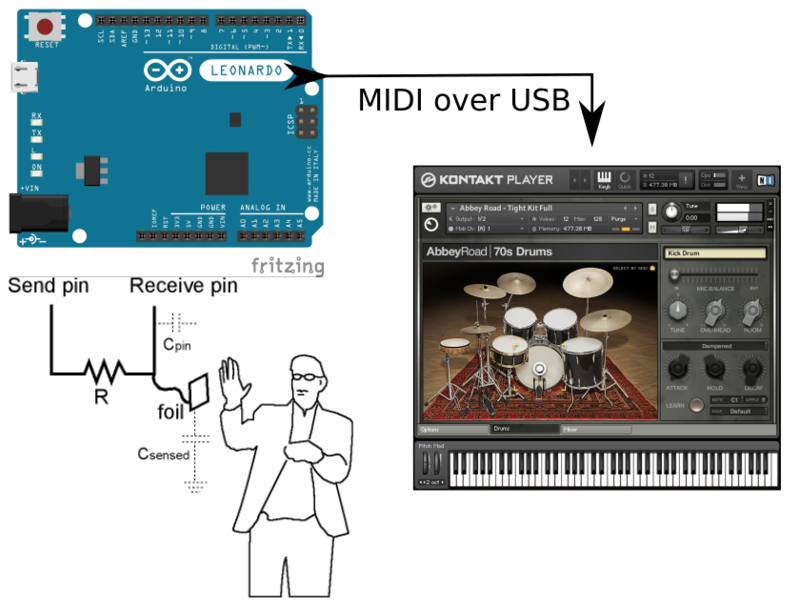 Here is a nice introduction for Arduino usage. What value should highpass have and how do we know if works correctly? A regular Arduino sketch can generally only run on the target microcontroller. This is because the application logic is mixed with the hardware-dependent I/O libraries, in this case CapacitiveSensor and MidiUSB. But Arduino is just C++. Nothing prevents us from separating out the application logic and making it hardware-independent so it can also execute on our host. The easiest method is to put the code into a .hpp, and then include that in our sketch and any host-only tools we have. This lets us use all the regular C++ tools and practices for testing and validating code, without needing access to the hardware. Automated unit- and integration-testing, fuzz-testing, mutation testing, dynamic analysis like Valgrind, using a continious integration services like Travis CI. In a project with custom hardware, it lets you develop most parts of the software before the hardware is finalized, potentially saving a lot of time. I like to express the entire application logic of the firmware as a pure function which takes Input and current State, and returns the new State. This formulation lets us know exactly what may affect the system – no hidden dependencies or state. Because all the inputs and outputs of the functions are plain-old-data, we can safely and meaningfully serialize and deserialize them. If we had used a dataflow system like MicroFlo, we would have gotten this introspectability for free. To store the execution this I used a Flowtrace, a JSON-based format for tracing Flow-based-programming/dataflow system. Because time is just data in our programming model (part of Input or State), we can run through hours of input scenarios in seconds. I made another plotting tool, this time reading the flowtrace, visualizing all the steps in our signal processing pipeline, and the detected notes. Avoiding false triggering for hovering hand, by looking at changes instead of absolute values. By going over a range of different input scenarios and seeing how different values perform, we get a decent confidence that the algorithm works. But does it actually run fast enough on the Arduino? The Atmel AVR chip on the Arduino Leonardo is an 8-bit processor without a floating point unit. So I was a bit worried about the exponential averaging filter using several expensive features: 16bit `int`, divisions and a multiplication with a float. Using a Arduino sketch to do some simple profiling showed that my worries were unfounded. The 100 iterations of the application logic executed it took 80 ms with both a high-pass and low-pass, or less than 1ms per execution. Since sensor readout is up to 10 ms, it dominates the time spent. So if we want lower latency, optimization efforts should be focused on sensor readout first. Only when sensor readout is down to around 1ms does it make sense to optimize the filtering. Testing the code with highpass-based in practice showed that yes, it did correctly detect tapping while supressing false triggers from a hovering palm over the sensor. Another benefit when using change detection a notes will trigger even if a finger is currently touching, and hitting the pad with another finger. With absolute value thresholding, the second finger tap is not detected. However, we also found that by moving the sensor to the outside, the data quality increases a lot. In this case, even the simple absolute threshold code was able to correctly discriminate a hovering palm. The higher data quality may also enable other features like velocity or aftertouch. Putting sensor on outside of body gives better readings, but requires additional manufacturing steps. Sensor-recording together with a separting hardware from application logic, and host-based simulation form powerful tools that help you better understand an embedded system. By visualizing the input data, the internal state and the outputs of the firmware, you can more easily see and understand the conditions which cause problems. The effects of changing the firmware can be quickly understood, as re-running the simulation suite on a wide range of inputs can be done in seconds. It can be implemented easily in C++ firmware, and any scripting language can be used for the data analysis. The techniques here form a baseline level of tooling which can be extended in many ways. If we had recorded a high-framerate video stream together with the input data, it would be easier to see how the input data corresponds to physical actions. We could annotate the input data to indicate the correct locations of notes (expected output of system), and write an automated test against the output trace to check how well the firmware detects them. By using data-driven testing, we could generate test variations over different inputs and filter configuration. And then use machine learning techniques to help find the best values for the filters. We could also create an end-to-end test covering the vast majority of the code by inject input sensor data in the on-device firmware over serial, and then verify that it produces the expected MIDI messages.